2011 was a historic year for solar in the U.S. We count down the most meaningful stats from U.S. solar’s record year. Today, GTM Research and the Solar Energy Industries Association (SEIA)® release U.S. Solar Market Insight: 2011 Year-in-Review, the industry's leading resource for data and analysis on solar markets in the U.S. This quarter's report analyzes the U.S.'s record solar growth in 2011, as well as what lies ahead for the market in 2012 and beyond. Below, we highlight ten key stats provided in the report’s free executive summary. The full report, along with annual subscriptions, can be purchased at http://www.greentechmedia.com/research/ussmi. 10) Eight. Number of states that installed over 50 megawatts in 2011. Eight individual states installed over 50 megawatts in 2011, up from only two in 2009 and five in 2010. Those states are California, New Jersey, Arizona, New Mexico, Colorado, Pennsylvania, New York, and North Carolina. 9) 1,219 megawatts. Total U.S. PV module production in 2011. PV module production fell from 1,273 megawatts in 2010 to 1,219 MW in 2011 as a result of global oversupply and the shuttering of a number of production facilities. The U.S. remained a hotspot for thin film production, with 32 percent of all module production coming from CdTe, CIGS, and amorphous silicon. 8) $4.08 per watt. Weighted average installed system price in Q4 2011. Thanks to a combination of falling component prices, compressed installer margins and a shift toward larger systems, weighted average system prices fell 20 percent over the course of 2011 to end the year at $4.08 per watt. 7) 28. Number of projects over 10 megawatts completed in 2011. In 2009, only two PV projects over 10 megawatts were completed in the U.S. In 2010, the number rose to eight. In 2011, 28 such projects were connected to the grid, marking the true beginning of a burgeoning utility-scale solar market. 6) 40 percent. Average module price decline from Q4 2010 to Q4 2011. Average PV module prices in the fourth quarter of 2011 fell to $1.15 per watt, down 40 percent from the same quarter a year earlier. These precipitous price declines were a boon to installers, but created an extraordinarily difficult year for manufacturers. 5) 776 megawatts. PV installations in Q4 2011. The U.S. installed 776 megawatts in Q4 2011, up 64 percent over Q3 2011 and up 115 percent over Q4 2010. Every market segment had a record quarter, as did ten individual states. 4) 41 percent. 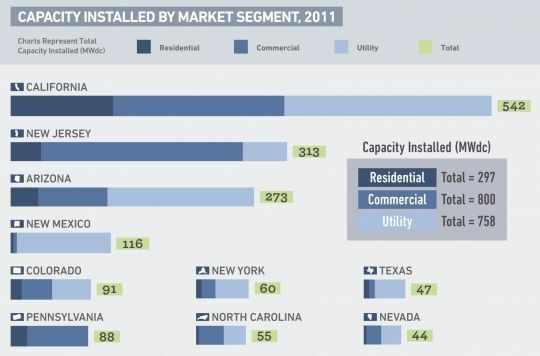 Portion of solar installations from the utility market. The utility market grew 185 percent in 2011 to reach 758 megawatts, accounting for 41 percent of all installations in 2011. There are over 9,000 megawatts of projects with signed utility PPAs in the pipeline, and over 3,000 megawatts currently in construction. 3) 29 percent. California’s share of national installations in 2011. California’s share of national installations remained steady at 29 percent in 2011. Meanwhile, the next six states grew from 45 percent in 2010 to 51 percent in 2011, indicating that the U.S. market remains reliant on top-tier states for overall growth. 2) 7.0 percent. U.S. Market share of global PV installations. The U.S. market share of global installations grew from 5 percent in 2010 to 7 percent in 2011, the country’s largest market share since 2007. We forecast continued market share growth over the next few years, ultimately reaching nearly 15 percent in 2016. 1) 109 percent. PV installation growth rate in 2011 over 2010. In short, 2011 was a historic year for solar in the U.S.
To learn more about the U.S. Solar Market Insight report series and subscriptions, click here.